18-Pack Heavy-Duty Plastic Tubular Hangers, light grey. 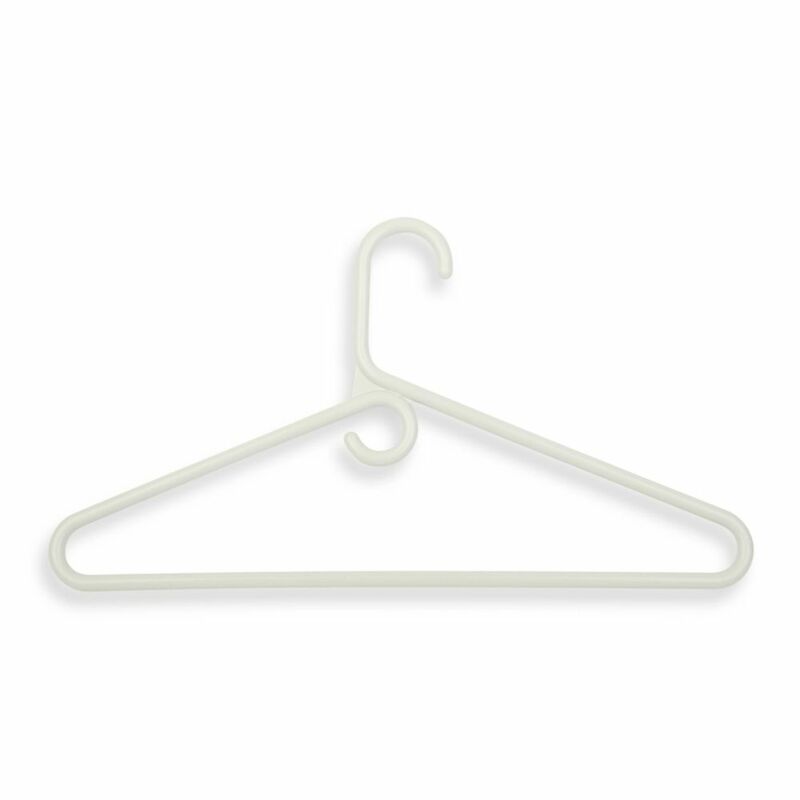 Versatile, heavy weight (86g) clothes hanger, perfect for jackets, shirts, and pants in an 18-piece value pack. The large rod hook is designed to fit over any standard sized closet bar. An integrated accessory loop keeps scarves nicely in place or hook an additional hanger in the loop to keep coordinating pieces together. A big help in the laundry room, these hangers are also great for air drying delicate. Honey-Can-Do HNGZ01527 8-Pack Wooden Pant Hanger with Clamp, Ebony. Beautiful, quality clamp hanger for storing all your pants and skirts. Features a 360 degree swivel hook to hang items easily on any closet rod. Strong clamp mechanism and grooved clamp surface provide a secure, wrinkle-free hold. Coordinate with our Wooden Top Hangers, Ebony (HNGZ01526) for a gorgeous closet upgrade in seconds. Honey-Can-Do HNGZ01222 16-Pack Wooden Pant Hanger with Clamp, Cherry. Beautiful, quality clamp hanger for storing all your pants and skirts. Features a 360 degree swivel hook to hang items easily on any closet rod. Strong clamp mechanism and grooved clamp surface provide a secure, wrinkle-free hold. Coordinate with our Wooden Top Hangers, Cherry (HNGZ01213) for a gorgeous closet upgrade in seconds. Honey-Can-Do HNG-01796 50-Pack Velvet Touch Suit Hanger, Tan/Camel. Beautiful, soft, and durable this clothes hanger is contoured to keep shirts, dresses, jackets, and pants perfectly wrinkle-free. Features a 360 degree chrome, swivel rod hook to hang items easily on any closet rod, towel bar, or standard size door. Durable metal construction provides strength, reliability, and long-lasting beauty. Soft velvet coating is gentle on delicate garments and provides a non-slip surface that holds fabrics beautifully in place. Slim, space-saving design makes the most use of available hanging space with its 1/4" profile. Honey-Can-Do HNGZ01221 16-Pack Wooden Pant Hanger with Clamp, Maple. Beautiful, quality clamp hanger for storing all your pants and skirts. Features a 360 degree swivel hook to hang items easily on any closet rod. Strong clamp mechanism and grooved clamp surface provide a secure, wrinkle-free hold. Coordinate with our Wooden Top Hangers, Maple (HNGZ-01212) for a gorgeous closet upgrade in seconds. 86g Light Grey Super Heavy Weight Hangers (18-Pack) 18-Pack Heavy-Duty Plastic Tubular Hangers, light grey. Versatile, heavy weight (86g) clothes hanger, perfect for jackets, shirts, and pants in an 18-piece value pack. The large rod hook is designed to fit over any standard sized closet bar. An integrated accessory loop keeps scarves nicely in place or hook an additional hanger in the loop to keep coordinating pieces together. A big help in the laundry room, these hangers are also great for air drying delicate. 86g Light Grey Super Heavy Weight Hangers (18-Pack) is rated 4.6 out of 5 by 10. Rated 5 out of 5 by Willa from I like my blouses to have sweet, smooth strength. And these hangers did it! I like my blouses to have sweet, smooth strength. And these hangers did it! Rated 5 out of 5 by Flemington from These hangers are very sturdy. Coats and other heavy garments can be hung using them. They are al... These hangers are very sturdy. Coats and other heavy garments can be hung using them. They are also a great value for the money. Rated 5 out of 5 by Deni from Good price for heavyweight hangars. Good price for heavyweight hangars. Rated 5 out of 5 by Darlin from Tired of broken, bent hangers? These sturdy hangers are perfect for heavy coats, jeans and people who pull their clothes off hangers. Rated 4 out of 5 by Cheryl from Kinda of what I expected The hangers aren't as strong as ones I had purchased in the pass but definitely study for what's out there now. Strong and rounded to keep sweaters from having pokey shoulders. Rated 4 out of 5 by Fence from Super Heavy Weight Hangers These hangers live up to their name. They are very sturdy and can hold my heavy coats and I believe other things if I tried it.